You can’t tell from this frame, but I’m dancing the cabbage-patch. BOOYAH! What’s your greatest game moment? My fondest game moment. Collecting celestial weapons for all the characters in FFX. Sounds like a miniscule endeavor. Ha! 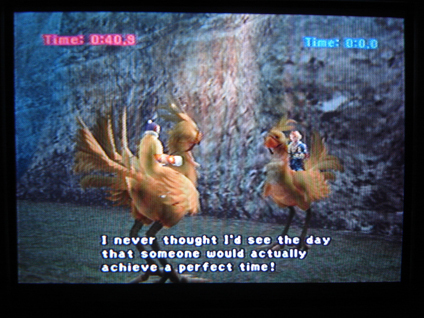 One may think it’s easy chasing and poking balloons in this Chocobo race. To obtain a Sun Sigil, one had to succeed a perfect time while angry birds- yeah I said it. tried to hurt you. Sounds simple. No siree! Tedious should be a nickname for Tidus. With a bit of careful anger management, and sanity loosely attached; that was all it took for Tidus to wield his celestial sword. Oh…yeah! Have you seen a space cadet do the hammer time? I knew you couldn’t resist.